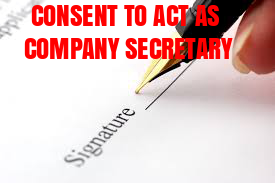 Sub : Consent to act as Company Secretary (KMP) of _________. I, the undersigned, do hereby give my consent to act as a Company Secretary (KMP) of ________________, pursuant to the provisions of Section 203 and 2(51) of the Companies Act, 2013. I, hereby further certify that I have not been disqualified to act as such under any of the provisions of Companies Act, 2013.